Arrive, unpack, feel good ...? On a total of 82sqm living room you will also feel a long time probably. The living room for your entertainment a flat screen TV and a stereo system located in the kitchen and a modern deck for relaxing moments, the kitchen is equiped with a ceramic hob and dishwasher. Whether you are visiting friends or family, want to get to know Oldenburg or work here, choose the individual and comfortable type of accommodation - in the middle of the city, directly on the beautiful Oldenburg pedestrian zone. On a total of 92m ² living room you will feel well for a long time. In the living room you will find a flat screen TV and a stereo for your entertainment as well as a modern daybed for relaxing hours. The kitchen is high quality equipped with a ceramic hob and a dishwasher. Please note that in the case of short bookings (from 3 to 6 days), we can only confirm bindingly if, prior to the arrival day and after the departure day, this is a direct connection booking to an existing booking. When booking, please also consider the number of minimum nights of 3 days. These can be found in our following booking calendar and the above price overview. If you have an apartment deviating from the above mentioned. To book restrictions, please contact us on 04494773. On a total of 80 m² living space you will feel well for a long time. For your entertainment you will find a flat screen TV and a stereo, the kitchen is well equipped with an induction cooker, an oven, microwave, dishwasher and small electrical appliances. Two more sleeps we offer, so that a total of 4 people can stay in the apartments. If you have a flat deviating from the above mentioned. To book restrictions, please contact us. • surcharge, you can rent a parking space on the plot bounded. Out of respect for our allergic guests, we ask for your understanding that smoking and pets are not permitted in the apartment. In your apartment towels and bath towels and bed linen and a basic set of cleaning products are available for you. The beds are made fresh for you. Extra pillows, bedding and bathrobes on request. There's also a washing machine at your disposal. All costs and utilities for heating, water and electricity are included in the rental price. In your 'your home-on-time' towels and bath towels and bed linen and a basic set of cleaning products are available. The beds are made fresh for you. There's also a washing machine at your disposal. All expenses and incidental costs for heating, water and electricity are included in the rent. The living room for your entertainment a flat screen TV and a stereo system and a modern deck for relaxing moments, the kitchen is equiped with ceramic hob and dishwasher. The apartment is located in Chapter 4. Floor of an office building and is easily accessible by elevator. Optional car parking on the property available. What they say in description is true-everything was just great. The Appartament and the ownwer is great, I recomend it. We were very impressed with this beautiful apartment. The location is just perfect. We felt at home right away. Very, very clean. The kitchen was just wonderful, everything you needed for cooking is there. The view is excellent from all the windows. 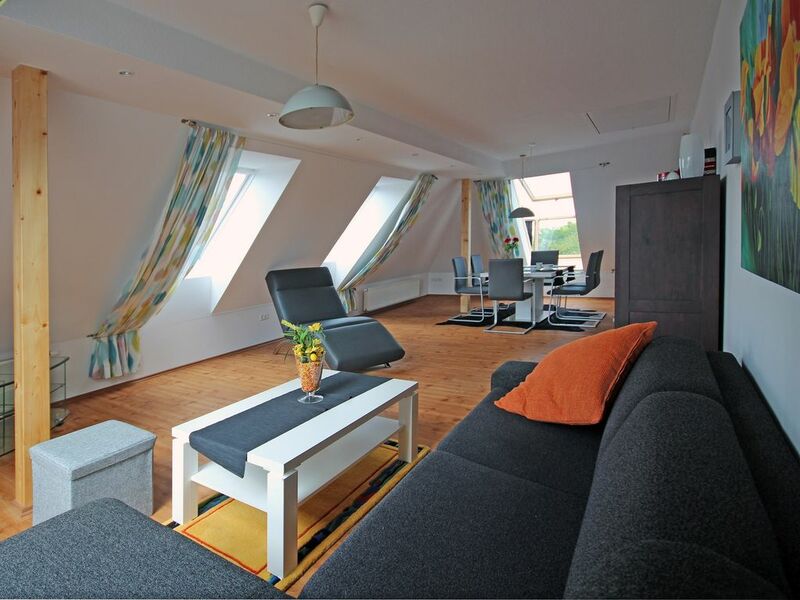 I can recommend this apartment to everyone that wants to spend some time in Oldenburg. Die Wohnung ist zentral gelegen, geschmackvoll eingerichtet und perfekt ausgestattet. Wir haben uns außerordentlich wohlgefühlt. Kommunikation mit dem Vermieter war jederzeit gewährleistet, die Schlüsselübergabe klappte perfekt und wir wurden sehr freundlich eingeführt. Eine sehr schöne, geräumige und sehr gut ausgestattete Wohnung. Die Vermieter waren sehr freundlich und hilfsbereit. Die Lage ist ganz zentral am Rand der Fußgängerzone. Wir haben uns sehr wohlgefühlt!!! 'Your home-on-time' is right on the beautiful Oldenburger pedestrian, the oldest, Germany, at the central Julius-Mosen-Platz. From here you can reach the Oldenburg State Opera and the Oldenburg castle with its beautiful castle garden in a few minutes. All the other attractions of Oldenburg and the University are within a few minutes by public transport - Several buses stop right outside your door. And if you are traveling by car and want to explore the area on your own, you can use optional front of the house a of restricted parking. Der Mietpreis von € 70 pro Nacht gilt bei 2 Pers, für jede weitere Person (2 weitere Pers.) sind zusätzlich je € 10 pro Übernachtung zu zahlen. Preis für eine Woche € 469 und längere Aufenthalte nach Absprache. Alle Preise incl. MwSt.. Bei Kurzzeitaufenthalten von weniger als 5 Tagen erheben wir einen Aufschlag von einmalig 35 EUR. Preis für längere Aufenthalte nach Absprache. Alle Preise incl. MwSt.. PKW-Stellplatz Option: tgl. € 8,00 Verbrauchsabhängige Kosten sind im Mietpreis enthalten. Bei Nichteinhaltung des Vertrages, Absage oder Nichterscheinen am Ankunftstag durch den Mieter bleibt der Anspruch des Vermieters auf Zahlung des Mietzinses erhalten. Der Vermieter behält sich vor, im Falle nicht rechtzeitiger Zahlung vom Mietvertrag zurückzutreten.